An Honest Review of The Linksys EA7300 Router – How Does It Stack Up? Our Linksys ea7300 review is about being able to experience the internet if you are a gamer that values lag-free online play without constant interruptions and connection drops. Then you can see the value in investing in a router that provides you with maximum throughput, a sturdy and strong wireless connection, as well as the adequate allocation of bandwidth to each and every device in your home. I’ve been through plenty of routers over the years which have met these expectations admirably, if only for a short while. But it wasn’t until I came across the Linksys EA7300 Max-Stream that I came to realize the power that a router can have in transforming your home into a seamless media-hub. By checking our Linksys ea7300 review you will know if this router fits your needs. Positive reports surrounding the EA7300 talk at great length about increased Wi-Fi speeds thanks to the device’s MU-MIMO technology. Its ability to handle multiple devices with high speeds is also admirable; and so far, there have been very few reports of compatibility issues with all devices including mobile phones, tablets, PC’s, Macs and current generation gaming consoles. In terms of Wi-Fi range, the EA7300 is geared for use in small to medium homes, so while it might provide a sturdy connection within a certain range. It isn’t always suitable for use in larger homes without the addition of a Wi-Fi range extender which will ultimately lower the speeds of connected devices. However, for smaller homes, this device is ideal for providing stable wireless connections, performing admirably in the face of data-hungry devices and services, and is incredibly easy to manage and monitor thanks to the Linksys Smart Wi-Fi app. For the price, users should expect the best from this router in terms of speed, reliability, lifespan, and functionality, and Linksys has delivered in a big way with the EA7300. Often with technology, you get what you pay for, and those who invest in this particular router are unlikely to suffer buyer’s remorse. The EA7300 is ideal for those households with high needs for bandwidth being spread across multiple devices. It works best in small home setups due to the limitations of Wi-Fi range but can pack a serious punch in terms of throughput thanks to the router’s onboard CPU. Those looking for greater Wi-Fi speeds will benefit from the router’s dual-band setup as well as its use of MU-MIMO technology and its stylish design makes it a great companion for those who are looking for an aesthetic touch to their home-office, play or media rooms. Although the Linksys AE7300 outperforms most other routers in its class when it comes to speed and throughput, it has a relatively limited Wi-Fi range which makes it unsuitable for networks in large houses or offices. It is also best used for intensive data transfers such as 4k streaming, delay-free buffering and online play with reduced lag. So, if you are a standard user who only needs to surf the web and check your emails, you may find the functionality and price of this router a little unnecessary. AC1750 MU-MIMO Dual-band Gigabit Wi-Fi technology, 450 Mbps (2.4 GHz) + 1300Mbps (5Ghz) for greater wireless strength and range. USB 3.0 compatible with file and printer sharing across local networks. 3x external antennas (non-detachable) ensures greater range and less interference. Onboard Dual Core CPU for maximum throughput and information transfer. FAT, NTSF and HFS+ file system compatibility across multiple operating systems. Easy to use browser-based setup. Linksys Smart Wi-Fi support for easier Wi-Fi management and monitoring. Beamforming technology for optimized performance and focused wireless signal to all connected devices for greater range, strength, and stability. 64/128-bit WEP; WPA2-personal and WPA2-enterprise security encryption for better protection and network security. Dual operation modes: Wireless router or Access point. Speedy hardware, easy-to-use software to control your network. Size is larger than common routers/modems. 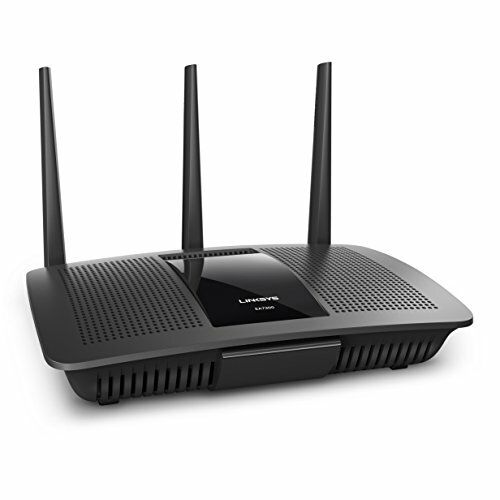 The Linksys EA7300 comes complete with a dual-core processor to allow for high-speed data processing, file transfers, buffering and maximum throughput while limiting lag, ping times and connection interruptions. This makes it perfect for tasks and homes that require the use of a lot of bandwidth such as online video streaming, sharing captures from gameplay in real-time and in 4k. You can breathe easily because ensures lag-free, uninterrupted online play on multiple devices at a time. The Linksys EA7300’s dual-band system works on both 2.4Ghz and 5Ghz simultaneously. Which means that your router can deliver a strong and stable wireless connection to more devices, in more areas of your home at a far wider range (and with more compatibility) than a single band router. Dual band systems can get up to 100x the wireless bandwidth than single-band routers, meaning there will be little to no Wi-Fi dead spots in your home. The separation of the network into two different frequencies also allows for the limitation of interferences being caused by any other wireless or radio operated appliances in your home. With Multi-User MIMO (multiple input-multiple outputs) technologies, your router can share bandwidth across multiple devices on your network at the same time. Most standard routers use single-user MIMO, which only allows for one device to receive data at a time. This means that each one of your connected devices can enjoy the full benefits of connectivity at any given time, without the performance of one needing to be sacrificed for the other. This makes it ideal for homes with multiple gamers, streamers or downloaders. The Linksys EA7300 Router comes packed with a small documentation flier, an installation booklet, a wall power adapter, 3 antennas, a warranty which is only available if you save the receipt and of course, the modem itself. The Linksys EA7300 is ideal for those households with high needs for bandwidth being spread across multiple devices. If you are looking for a networking solution that is unparalleled in performance and functionality, especially when it comes to online gaming and streaming on current generation consoles. The Linksys EA7300 could be the ideal companion for you and your rig. I hope you liked our Linksys ea7300 review and if you have any questions feel free to ask.